It's that time again. Subscription box time. 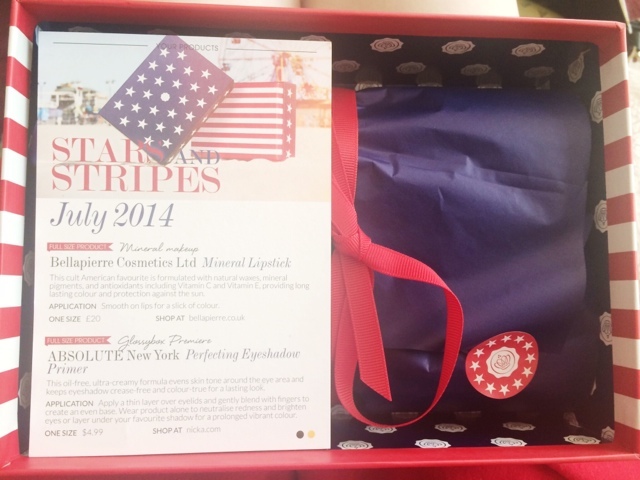 This months Glossybox was all about Stars & Stripes. So let's get into what was in this months box. 1. Bellapierre Cosmetics Ltd Mineral Lipstick in Cat Walk which is a really nice, pretty peachy pink kind of colour. It feels very moisturising when watching on the hand. Only thing I'm not keen on is the packaging. Although it looks really nice, it feels very light and cheap which let's it down but otherwise the colour is really pretty. 2. Next is the Carmex Lip Balm. You thinking what I'm thinking? What on earth is this doing in here's that's a couple of quid that I can buy from anywhere. I'm a little disappointed with this and this let's the box down completely. 3. Next is the Color Club in Glossy Seal. 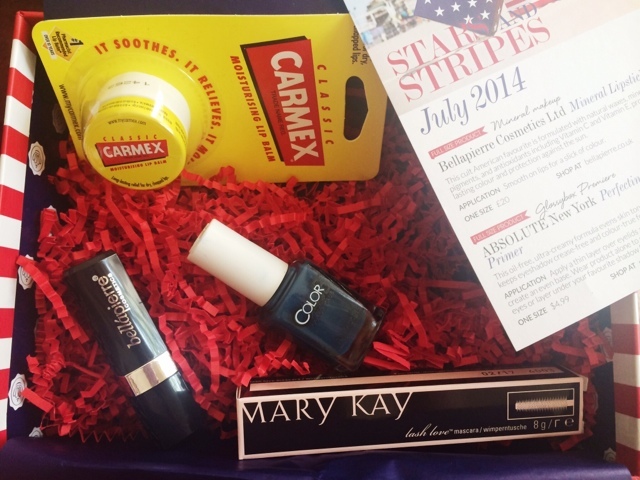 A nail polish that was been especially made for this box which is a really awesome feature this month. It's apparently a non-toxic, cruelty free formula and I am really excited for this. I have other shades similar so it's not a massive excitement but looking forward to giving it a go. 4. Mary Kay Cosmetics Lash Love Mascara made up for the more disappointing products in the box. The brush looks like one I will get on with and I don't think I've ever tried anything from this brand so will be giving that a go in the morning and see how it makes my lashes look. Hopefully awesome and long and voluminous and everything else you could want lashes to look like. 5. This is where I was really let down by this months box. This product was supposed to be an eyeshadow primer from ABSOLUTE however it wasn't in my box. As you can see from the photos, there are only 4 products in the box. I have emailed them so I may receive it sometime soon or maybe not but what was already a pretty disappointing box didn't exactly give me much hope for future boxes but the non disappointing products I'm excited to try. So that's this months Glossybox. If you are subscribed to this subscription service, do you have the same thoughts or experiences that I do?